McLaren's Belgian driver Stoffel Vandoorne (L) and Spanish driver Fernando Alonso pose by the MCL33 Formula One racing car for the 2018 season. Double world champion Fernando Alonso said he was "excited but also apprehensive" as McLaren became the final major Formula One team to unveil their car for the new campaign on Friday. The British team have endured a miserable run in recent years but after ditching beleaguered engine partner Honda and teaming up with Renault they will be desperate to make a bigger impression in 2018. Their new car sports a changed livery from last year's design, with an all-orange bodywork and a blue front and rear wing. Alonso, 36, looked certain to leave McLaren last year following a disappointing season but decided to extend his deal after the team terminated their miserable relationship with Honda. 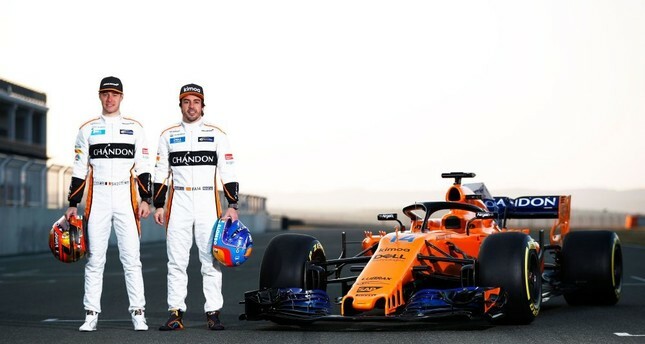 "Looking at our new car, I feel incredibly excited but also apprehensive," said Alonso, who failed to finish more than half of the races last season. "I know just how important this car is to the team, and I just hope that it delivers in the way we all want it to. "If we're able to develop the key strengths of last year's chassis and marry it to an improved Renault power unit, then I think we'll be able to take a step forwards." Alonso will once again be partnered by Belgian Stoffel Vandoorne, who enters his second season with the team. British teenager Lando Norris joins as McLaren's reserve driver. McLaren, a winner of 20 combined drivers' and constructors' championships, have not won a race since 2012 and have not had a car finish in the podium places for four years. Lewis Hamilton won the last of their driver titles a decade ago. But the team are optimistic about their chances ahead of the season opener in Melbourne next month. The new car will be put through its paces during a filming day in Spain on Friday before the opening test of the winter, which starts in Barcelona next week.